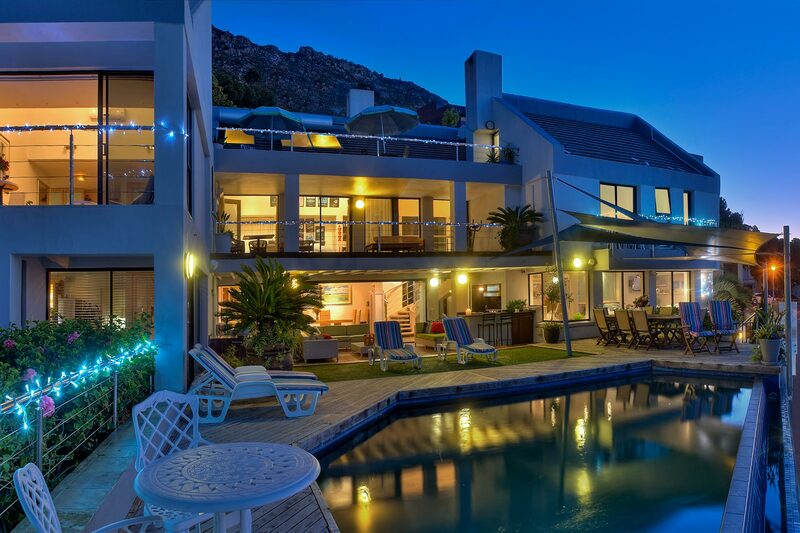 Watch our promotion video (1:37 min) for an in depth impression of our boutique self catering accommodation in Gordons Bay. 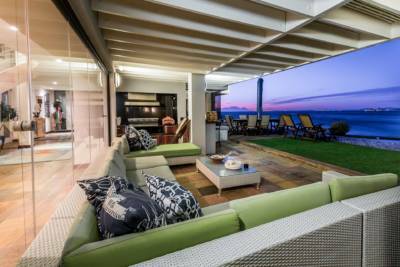 TripAdvisor winner for 5 consecutive years, this luxurious seaside self catering accommodation in Gordons Bay, near Cape Town, is owned by theater Life-time Achievement Awardee, Richard Loring, and his wife, Jeanette. 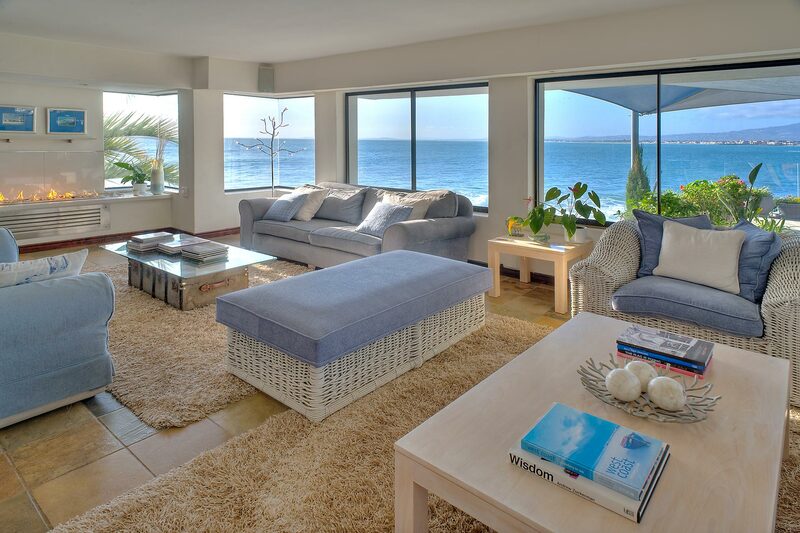 Enjoy a magnificent ocean view and the refreshing fragrance of the sea from ALL boutique suites and apartments … also views of mountains, the marina and spectacular sunsets… or laze around the sea-water rim-flow pool and watch yachts set out to sea and the surf break just meters away..
On the sunny False Bay coast, protected in Bikini Beach Cove, 185 on BEACH is close to the beach – blue-flag Bikini Beach is 200m away – so enjoy a safe stroll, also to the seaside restaurants close by and the quaint village beyond. 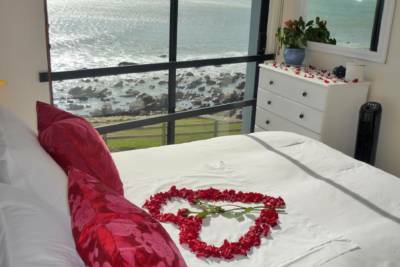 Close to the Garden Route and Wine Route, on the famed Whale Route between Cape Town and Hermanus, and 35 minutes to Cape Town Airport, this is an ideal base to enjoy your honeymoon, golf, Cape adventures, or to relax with the pleasure of a romantic seaside holiday. 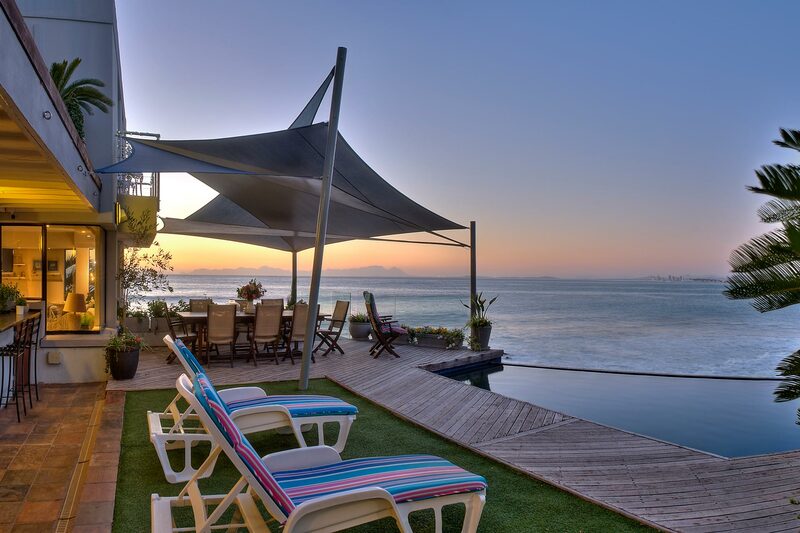 A refreshing swim in our crystal clear sea-water swimming pool and our water-saving systems show we are prepared for your visit to our B&B and self catering accommodatin in Gordon’s Bay. 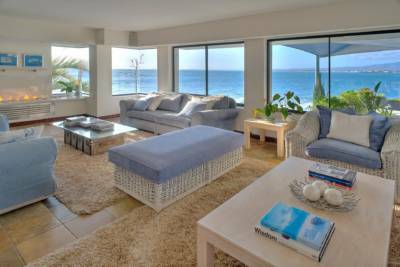 Find your suitable option out of our six luxury apartments. 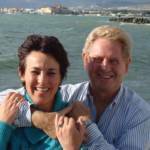 We offer B&B options as well. Your best self catering accommodation in Gordons Bay. 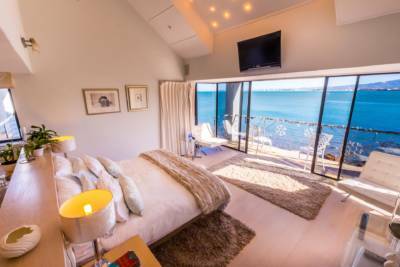 Luxurious décor and facilities delight discerning guests – traveling for business, family holidays and birthday celebrations, while the seaside location close to a spa makes 185 on BEACH perfect as honeymoon self catering accommodation in Gordons Bay with a sea view. 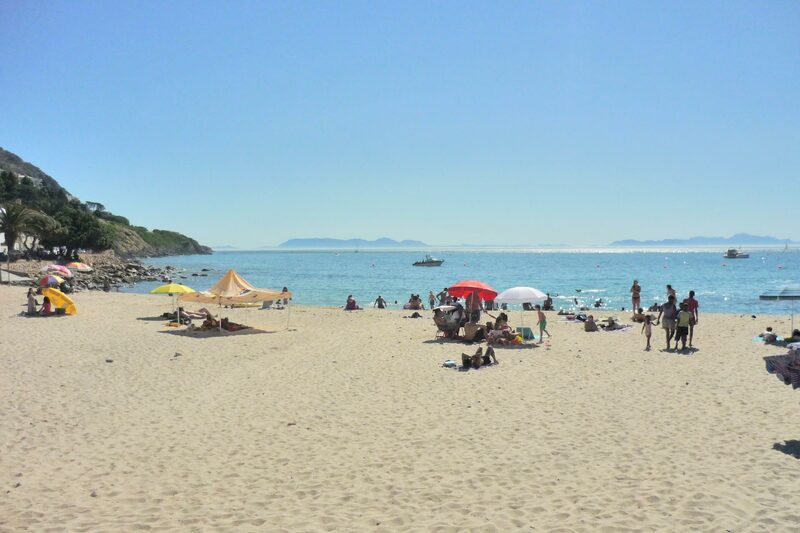 On the shore of warm False Bay (not cold Atlantic!) 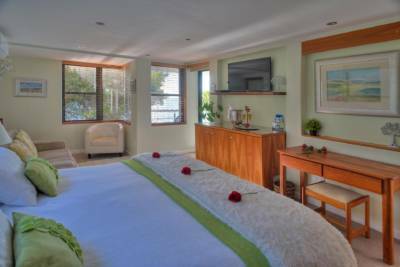 – Stroll to restaurants, marina and quaint village, even at night because we are in a secure cul-de-sac. 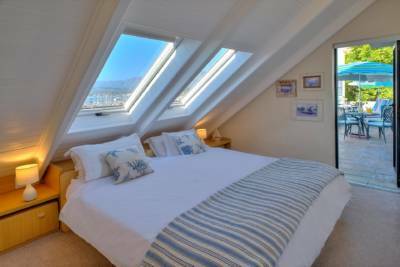 Central in Cape – 35 Mins to Airport, 50 mins to Cape Town & Hermanus, 5 – 15 mins to Winelands, Whale Route, golf and many adventures. 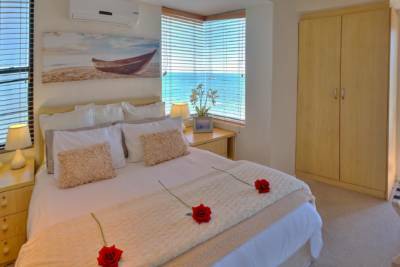 Rates – Variety of accommodation to suit your pocket. 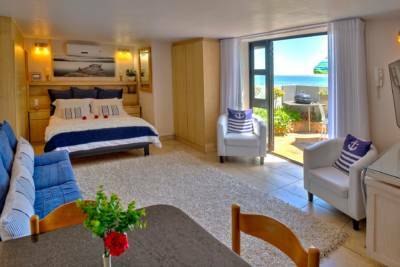 From R370pp (low season) to R1400pp (peak season). 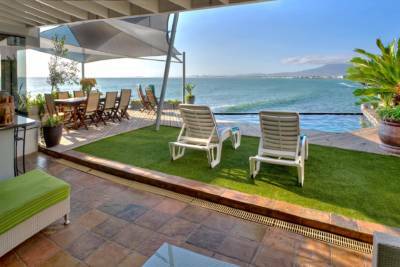 Magnificent 270 Degree views – of ocean with yachts & cruisers, seals and dolphins, surrounding mountain ranges, winelands, marina & spectacular sunsets against Table Mountain across False Bay. Local Attractions for a perfect holiday – Enjoy many relaxing and adventurous things to do – see our ‘Activities’ section for your favourite activity. This place was recommended and surpassed all our expectations a million times – Thanks! It’s a stuning place to start our journey. Waking up to the waves is awesome. The view is breathtaking Tx! For one weekend I lived my dream. Fantastic!!! Décor in Penthouse beautiful. View splendid. Great service. Awoke to sound of breaking surf. Breathtaking views of ocean and mountains from private patio. A short stroll to village & beach. Stylish, superior, conveniently situated & accessible. We have had a fantastic stay in a majestic location. Ideal for staying in or taking day trips in and around the area. We will certainly be returning and recommending this fantastic spot to all and sundry. Thank you very much. Awesome! Awesome! Awesome! We recommend this piece of paradise to everyone. From the first day we felt at home. We will be back! Everything we expected and more – Thanks for an unforgettable time!